‘The local people follow the stars and always know when the emu eggs are ready to be collected. They will be laying eggs very soon,’ says preschool teacher Kimberley Dove, who follows the emu cycle at the preschool with the children. It is a poignant introduction to Barlu Kurli—a NSW Department of Education and Communities (DEC) preschool attached to Wilcannia Central School in the Murdi Paaki region of remote New South Wales. Located on the Darling River, Wilcannia is a desert town in the NSW far west with a population of approximately 700 people—75 per cent of whom are Aboriginal. It is home to the Paakantji (Barkindji) people, which in the local tongue means ‘people of the river’. Not surprisingly, the river is a symbol of life for this community. Indeed, the name Wilcannia reputedly means ‘a gap in the bank where flood waters escape’. Wilcannia was once Australia’s third largest inland port during the great riverboat era. Known as ‘Queen city of the West’, it peaked in the 1880s when the town had a population of 3,000, 13 hotels and even a local newspaper, The Wilcannia Times. The development of Australia’s railways saw the steamboat trade diminish and eventually dry up. Today, the main industries in Wilcannia are in education, health care and social assistance. Unemployment is an ongoing challenge. But any metaphors about gaps in the river and ‘Closing the Gap’ rhetoric are sadly all-too familiar in this town, where agencies abound and bureaucrats regularly fly in and fly out. The people of Wilcannia are naturally wary of journalists. They have been burnt before, with several negative articles written about the flow of government funds into the town. When it comes to early childhood education though, the story is overwhelmingly positive, and one in which the people of Wilcannia should be proud. Rattler spoke with Tracey Simpson, who works for the Department of Education and Communities as a Director of Community Partnerships and Early Years Director (Western NSW). ‘The people of Wilcannia have been hurt on so many levels. The impression the rest of Australia has of the town is a negative one and that hurts. ‘It is a fabulous little town. It has a rich history of two cultures, and is one of the most beautiful places in country NSW,’ she says. Tracey’s position is unique to the region and was created to bring about real, lasting change in Aboriginal communities via early childhood education. Wilcannia is a Remote Service Delivery site, which is part of the COAG National Partnership Agreement to provide better co-ordinated services for Aboriginal people. Wilcannia is where the community working party concept first originated. In the 1990s, the town experimented with a unique form of governance, creating a Community Working Party (CWP). The CWP is considered the first port of call for any government agency. It comprises community leaders, elders, community- based and Aboriginal-controlled organisations. Representing the school, Tracey regularly attends CWP meetings along with Wilcannia Central School principal Michelle Nicholson. While early childhood has become a real focus in Wilcannia, this was not always the case. Previous children’s services had closed including a preschool at St Teresa’s (‘the mission school’) and a private long day care centre called ‘Little Darlings’ proved unviable. Issues around staffing and low attendance were to blame, says Tracey, explaining how the DEC model best suits Wilcannia. ‘It means we can always have a teacher in Wilcannia and still employ local people such as Aboriginal assistant ‘Aunty Tania’. ‘Some regional preschools struggle to retain early childhood staff but Wilcannia can provide a job and a house through the Teacher Housing Authority,’ she says. There is a spirit of co-operation between Wilcannia Central and St Therese’s Infant School (established by the Sisters of Mercy in 1916), which is unique to the town. There is a tradition of children attending Karlu Burli Preschool then ‘crossing the river’ to go to St Therese’s for Kindergarten to Year 2, before returning to the Central School. Another success story is the marked increase in preschool attendance. ‘There has been a real push to boost numbers, and a concerted effort to make families feel welcome. We have 24 children enrolled and daily attendance ranges from 16–20,’ says Tracey. Engaging families in the preschool program will hopefully have a flow-on effect, improving attendance into primary school and beyond. The preschool’s 14-seat community bus has also helped break down barriers and build relationships with families. ‘The bus is almost a teaching and learning experience in itself,’ says Tracey. Driven by elder David Clark, the morning and afternoon bus runs allow Kimberley to meet with parents and make those important connections. Preschool children, or ‘murrpa-ku’ as they are known, get a certificate after five consecutive days of preschool and a prize is given to the child with the highest attendance at the end of the year. Whenever a child is born in Wilcannia, its family is issued with a donated Care Flight teddy bear by the preschool. ‘Aunty Tania always knows when a baby is born, and Kimberley is usually the first one to have a cuddle. ‘When you see a parent put a tiny baby into Kimberley’s arms you know that is trust,’ says principal Michelle Nicholson. Together with regional language co-ordinator, ‘Uncle Murray’ Butcher, Kimberley is part of the Barkindji Learning Circle—a group of elders and other community members who are helping to preserve the local language. ‘I am honoured that the people of Wilcannia are willing to share this knowledge with me,’ says Kimberley. Uncle Murray is one of the few fluent Barkindji speakers left. He is employed by the Department of Water, Heritage and the Arts (DEWHA) as a regional resource and has an office at Wilcannia Central School. Along with parents and elders, he regularly takes preschool children on trips into the bush to look for emu eggs, identify animal tracks, and collect different bush foods. Wherever possible, Kimberley and staff also try to provide children with a strong sense of identity. ‘We hope to provide children with a basic knowledge of resilience and belonging… We use praise and recognition to help address issues of shyness and shame that is faced by many of our older students,’ she says. The preschool is visited twice a term by the Remote Mobile Resource Unit’s toy and book library, and staff work closely with the Broken Hill-based Maari Ma Health Service. This outreach program offers dental and dietary programs as well as antenatal and postnatal clinics for young mums in the town. As the only early childhood facility in town, the preschool is the obvious contact point for families to access other services, explains Tracey. There are moves to construct a new building as a community hub as part of the Remote Services Delivery program. The concept of the Belonging centre is just one example of the influence of the Early Years Learning Framework (EYLF) in Wilcannia. 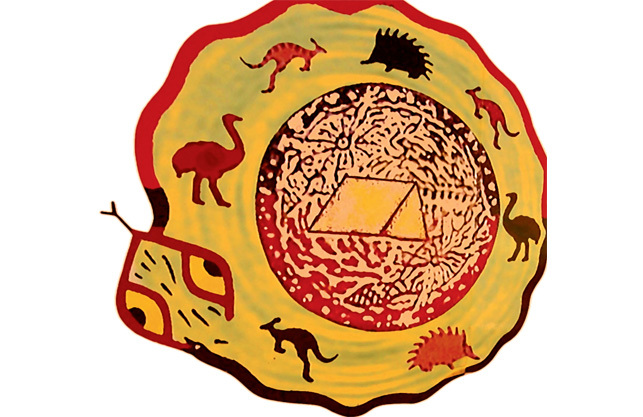 The other is a project to link the EYLF’s Five Learning Outcomes with the Aboriginal pedagogy framework ‘8 Ways of Learning’, which allows teachers to include Aboriginal learning techniques— ways of knowing, doing and being. Kimberley is already using the symbols and concepts of eight ways in the preschool program. The EYLF is also explored on a DVD produced by Kimberley, which screened at an education forum in Cobar last year. So what’s next? Along with the Community Working Party (CWP), Tracey and Michelle are now working with the region and school staff to turn Wilcannia Central into a Paakantiji School that embraces the lores of Paakantiji (Barkindji) culture. This is an exciting and historic move. There is change in the air in Wilcannia. The drought has broken and the desert peas have flowered. And as Michelle Nicholson says on Kimberley’s DVD: ‘with the smiley shiny faces, I can see the future of Wilcannia’.